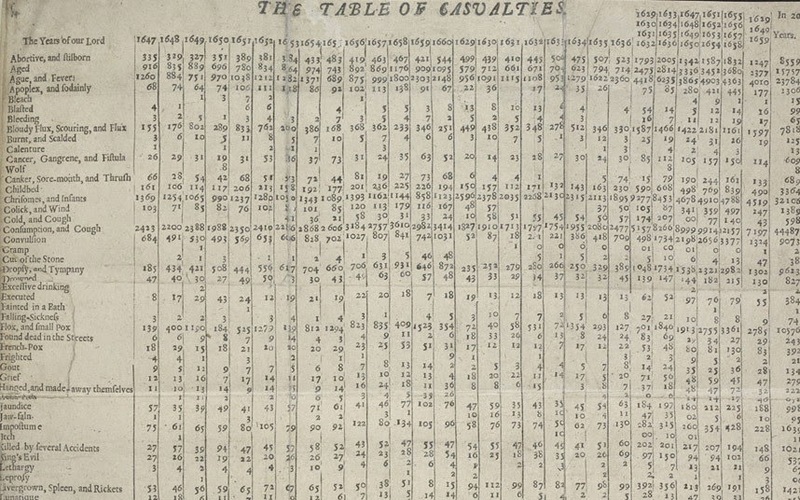 This is a page from John Graunt's Natural and Political Observations Made Upon the Bills of Mortality listing some of the recorded deaths from 1662. Here we have Excessive Drinking, Executed, Grief, and Leprosy, as well as "French Pox" and the King's Evil (both of which I covered on Kimber Vale's blog yesterday). Although some people did die of "Itch" (12, to be precise), most deaths were caused by much scarier things. To follow up from yesterday's piece, here are five of the most common (but no less horrible) ways to die in Restoration London. Childbirth and Puerperal Fever (Childbed Fever) - Complications and infections related to childbirth were the number one killer of women. Puerperal fever could be contracted during or after childbirth or miscarriage, and was often caused by genital tract sepsis from improper hygiene. Of course, they might not even get the chance to contract it: if it took too long for the afterbirth to come out, impatient midwives might reach in and just pull it out. This could result in acute inversion of the uterus, which would definitely kill them. If you missed Part 1, visit Kimber Vale's blog for Five Horrible Ways to Die in Restoration London. You don't want to miss the Plague! Stop back tomorrow for the cover reveal of Tami Lund's Dawning of Light (Lightbearer, Book 2)! I'm not allowed to show it to you just yet, but believe me when I say that it is gorgeous! I can't wait to share it with you!